Jonah Hill received an Oscar nomination for his performance in Moneyball, a surprisingly dramatic role for the regular player Judd Apatow’s band of man-children. How coincidental that the star of Apatow’s debut feature (following the massive success of “The Office”) also received an Oscar nomination for his first truly dramatic turn, along with a dedicated performance from Jonah Hill’s 21 Jump Street co-star, Channing Tatum. Not to mention Mark Ruffalo’s outstanding supporting performance, which was included in the stacked category of Best Supporting Actor at this year’s Academy Awards. The actual screenplay by E. Max Frye and Dan Futterman is kept rather simplified, implying far more than is actually said. The plot is based on the true events surrounding an eccentric multi-millionaire’s foray into the world of Olympic wrestling. Mark Schultz (Tatum) is a champion wrestler, but can’t seem to find a way out from under his brother’s shadow. David Schultz (Ruffalo) is also a champion wrestler, but also has a family and his own business, which is the gym that Mark trains at. When summoned by the odd John du Pont to live and train on the grounds of his absurdly large estate, Mark sees the opportunity to forge his own path. This is where the film gets a bit hazy with details, and I will refrain from assumption, both because of the controversy these sequences caused for one of the survivors of the real story and because the real significance is the feelings of dread and subtle foreshadowing done by these ambiguous moments. By the time that David joins Mark to train, there seems to have been some emotional trauma already done. Even with wrestling at the center of the storyline, this is less a film about sports than even Moneyball was. At 134-minutes, Foxcatcher may feel slow for some filmgoers. It is a film that builds tension at a deliberate pace, however untraditional it may be with the typical Hollywood fare. This also allows for the performers to truly flourish in these roles, making the three leads a defining reason to watch the film. 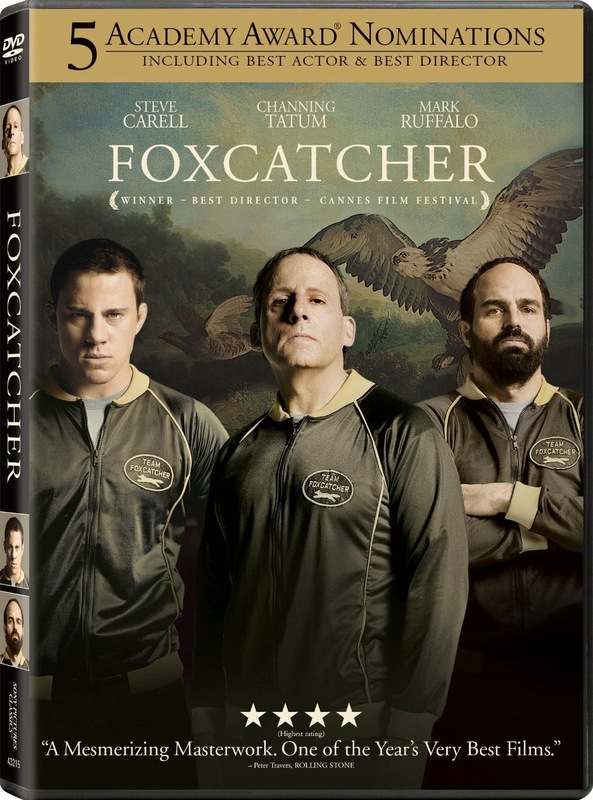 The DVD special features include a handful of deleted scenes, as well as a featurette about the real story behind Foxcatcher.